Mod meets modern in this simply, yet beautifully designed table. The Blaze Dining Table's clean lines and sleek style make it a seamless fit for many decors, while slender angled legs and an artfully angled trestle base add artistry and intrigue. A solid walnut frame adds durability and stability, while walnut frame veneers with a natural finish add an organic touch of warmth and character. 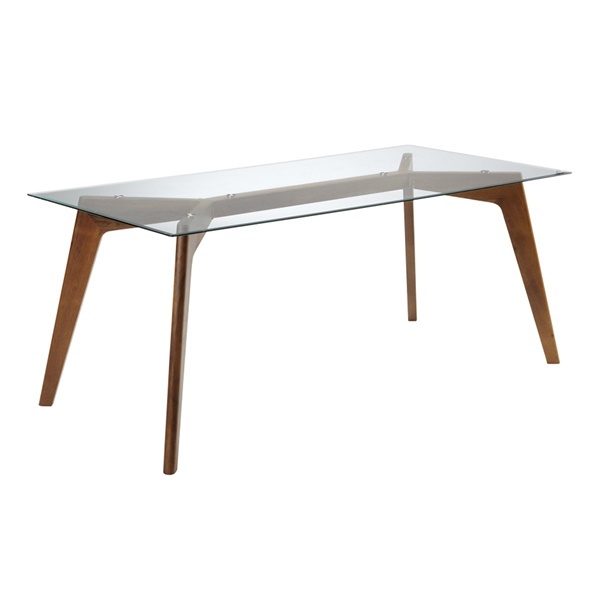 The table�s top is crafted from durable, 12mm-thick tempered glass with artfully beveled edges. The glass resists chipping and cracking, ensuring years of use and enjoyment, and provides a sleek and polished contrast to the wood base. Thank you for your interest in the Blaze Dining Table by Sunpan! The base / legs of the Blaze Dining Table are made of solid walnut with a durable walnut veneer.